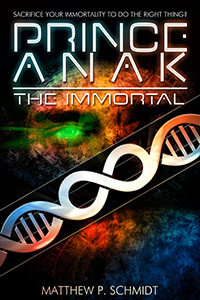 Prince Anak the Immortal, a manuscript entirely unrelated to anything posted on this blog is now finished! Yay! I had attempted a psuedo-NaNoWriMo novel. I call it psuedo, because I started in mid-October, but planned not to work on the weekends, for a total of around thirty days. I say attempted, because the story shrunk in the telling until it was under 25k words at the finish. In any case, I finished a day early, though there’s some editing needed. I was trying to pull it into a novelette when NaNoWriMo came along, which I decided to attempt (sorta). Originally I was going to do the first book of The War Against the Gods, but after hashing out the novelette with my Mom it seemed the more logical to do that instead. I was also going to submit the revamped, and significantly different, version again to Tuscany Press and another religious publisher, this time as a young adult novel, but real life intervened. The other publisher decided not to reopen submissions, and the end manuscript is too small for Tuscany Press. That, and it might be tacky to resubmit, but who knows? Thus, I now have a finished first draft of a manuscript, which I intend eventually to self-publish (or indie publish or whatever the cool kids call it these days). My rabid fanbase of relatives and imaginary friends can expect it sometime in April. We’ll see. What’s it about, I hear you ask? It’s about an immortal prince, an antimatter factory, and doing the right thing, even if it costs you your life. More to come, later. There are some books so good that they’re worth reading even if you disagree with them. This is one of them. Most of the book is dedicated to a tour de force through computing, mathematics, and physics. The book is intended to be read by laymen, though sometimes the “simplifications” seem to make things more complicated at first. I read every word, but I think I only understood around twenty percent of the book, and most of that was things I already knew. Of course, I actually agree with Penrose’s main argument, but I know (and Penrose readily admits) it’s quite controversial. The argument? It is that theorems such as the Halting Problem and Gödel’s incompleteness theorem prevent a strong AI from ever being created, or, in short, that brains are not computers. Penrose’s specific argument relies on a kind of mathematical Platonism, again, a controversial view. I’m not sure if I agree with the existence of numbers as some kinds of eternal, uncreated things. Did God create the integers, or are integers an aspect of God? Certainly mortal conceptions of logical systems are flawed, as shown by Godel’s incompleteness theorem. But from God’s perspective, knowing through Omniscience all true logical propositions, is He seeing the Creator or Creation? The form of objective reduction of Quantum Mechanics that Penrose proposes does not actually rely on observer effects, which is relieving. Penrose has a point that a world requiring conscious beings to collapse waveforms is absurd in that most of the universe does not actually exist. This does bring the question of how free will interacts with the world, but Penrose does not claim to explain everything in Heaven and Earth, but only that the emperors of Strong AI are naked.